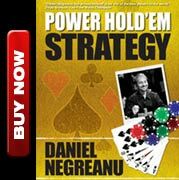 Historically, Las Vegas has never been able to support more than one poker room when it comes to high limit action, but that appears to be changing. Last night, Bobby's Room at Bellagio had two NL games going, while there were two or three high limit games mixed games at Aria. Not to mention the fact that Tony G was also playing high limit poker over at the Wynn. Bellagio since late 1998 when they opened their doors, Bellagio has been the central hub of all high limit action that previously occurred at the Mirage. Up until this year, really, if you wanted to play high limit poker, this would be the only game in town. The room is laid out very well. There is a top section for higher limit games, and then they have the exclusive Bobby's Room which has two tables, a sitting area, and plenty of room and privacy. There is a podium right outside the glass doors where a floorman will usually stand to help ensure that there isn't a lot of traffic going in and out of the room. Nevada laws do not allow private games in casinos, so the doors to Bobby's Room must remain open. However, there are two doors, and one is usually closed which makes random tourists more hesitant about just walking into the room and up to the table. That really is kind of important. When people are playing for high stakes, or any stakes for that matter, they don't want a stranger standing behind them just "hanging out." Food situation is very good at Bellagio. For the high limit players, they get comps to any/all restaurants in the casino. This isn't a big deal to me personally as Patty usually packs me a lunch/dinner, but it is a nice luxury for most of the players who'll often go down there to play and also have dinner. Parking situation is also decent. North valet is pretty close to the poker room and is far less busy than the main valet. The room location is probably the one knock in terms of tourist traffic. The poker room is kind of tucked away next to the sports book, so you don't have much traffic walking by like you would at Mirage (more on that later). There is no bathroom in Bobby's Room. They certainly had plenty of room to add one, but decided that the smell could be an issue so opted not to add one. The trek to the bathroom from Bobby's Room is a bit of a walk. You have to go through the poker room, then over to the sports book. That's only an issue for guys who don't really want to miss a hand! In terms of game selection, Bellagio offers a wide variety of games and if you are a limit hold'em player, it's pretty much the only place in town to play. In recent years, I've heard lots of complaints from the $200-$400/$300-$600 players about the way they were treated by staff at Bellagio. I've never personally had an issue with any of the staff there, but the group of people dissatisfied with the staff was large enough that it prompted a move to Aria. The regulars who would normally play at Bellagio, have successfully been able to move the game to Aria (more on that later). In closing, the room is well organized. The top section holds five tables with plenty of room in between the them, and there is an element of privacy to it, as it's slightly elevated with frosted glass surrounding the whole area so no railbirds on the lower section can get a peek at your cards while you play. The lowest limit games are on the left as you walk into the room, the limit hold'em games to the right, and of course Bobby's Room is straight back and is the best high limit room in town. Aria The new kid on the block took an aggressive approach to trying to win over poker players, by offering free food. That didn't last long, though, as many of these poker players are gluttonous vultures who were sure to ruin a good thing by ordering $500 dinners and inviting friends and family to pig out in the Ivey Room. It was one of those "Too good to be true" scenarios that ultimately fails because human nature is to abuse a good thing. As Mr. Anderson from the Matrix points out, the human race is a wasteful bunch! Seriously though, these guys who would normally order a $35 dinner all of a sudden would go off for as much as they could because it was free. Did they really think that would last? No poker room can fade a group of overweight poker players going to town on the high end menu day after day. Eventually, Aria changed it's policy and now offer a $40 food comp for poker players during a session, which essentially comes to about 2.5 hours worth of rake, as they pay $9 every 30 minutes. That seems more than fair to me. As mentioned previously, I've never really had any issues with staff at Bellagio or Aria, but I listen, and the players seem a lot happier with the floor staff at Aria. The Ivey Room isn't practical. It's not big enough to squeeze two tables in there, and it probably should have two tables in there. It's also too big for one table. There is just a bunch of dead space the way it's set up. You walk in, there is a tiny bench on one side and then a counter on the left for the floor. It's shaped really weird. The Ivey Room does have something HUGE over Bobby's Room, and that's a private cage to access your safety deposit box. It's definitely a luxury that the players appreciate, myself included. I don't really like playing in the top section at all. If you want to start a high stakes game, but don't get there early, you won't have access to the Ivey Room. It's one of the key reasons they needed to have two tables in there. The top section is a bit chaotic and cramped. You could be playing $1500-$3000 and have a $12-$24 limit game going right behind you. It's also pretty wide open for tourists to walk through and rail. Parking situation is average. If you live in town and are driving in, you'd likely avoid the strip and come in through the back way on Harmon. The valet walk from there to the poker room is just a little further than the walk at Bellagio. I'm not sure exactly why this is, but there seems to be more random walk ins while playing in Ivey's Room. I'm not talking about people looking to play, just randoms who walk in and stare. The staff at Aria seems a little more reluctant in asking these people to not stand behind the table and I think they should be a little more aggressive with it. Whether you are playing $1-$2 or $1500-$3000 the floor should have every right to tell people not to stand directly behind the players as they are playing. It's uncomfortable. All in all, the Aria room doesn't blow me away as it seems to have with the regulars, but in the end, you go where the action is, and they do have a regular game going both days and nights. In total, I played 9 matches. At the outset, I was 1-4 then went on to win my next 4 matches going 5-4 and showing a small profit. I played the likes of David Oppenheim, Joe Cassidy, Mimi Tran, Tony Bloom, Barry Greenstien, and a guy named "Persian Sean." More recently Tony G has been starting games there as high as $2000-$4000, I think Omaha H/L and maybe Pot Limit Omaha. The parking situation at Wynn is the best in town. Self parking is literally right next to the poker room. The trek to the bathroom, however, is a bit further than most of the other rooms. Wynn doesn't have a private room, just a top section with about 5 tables. It's been a while since I've been there so I'm a bit unfamiliar with what they have to offer in terms of games, but if you are looking for lower no limit hold'em games, I hear the games at Wynn are pretty good. Mirage This is the room where I sweat blood and tears back in the late 90's when I was first trying to make it as a poker pro. I starting out playing $10-$20 and $20-$40 limit hold'em, and eventually rose to the $40-$80 and occasional $75-$150 limit hold'em games. I love that place to be honest. I don't know if it's just nostalgia or the fact that the room is easier to concentrate in due to the darker colors, but I can still smell the Mirage when I think about it. I loved the energy of that room. It's the one room I'd call home. I can still remember the lonely walks back from Mirage to Budget Suites at Paradise and Twain at 3:00am after I went broke for the umpteenth time. Soul searching, analyzing what went wrong, then trying to figure out what I was going to do next. My life back then was very different. I'd wake up, take a quick shower (sometimes) then walk about 20 minutes to Mirage. Once I got in a game, there was no eating. I'd take a round off once in a blew moon to get a croissant and a yogurt at the snack bar. I'd barely miss one round. All I did was play poker. It was kind of awesome in a twisted way. I loved the game, loved the life, and loved the challenge of taking on the Las Vegas locals in the hopes of becoming one. I lost that challenge time and time again, but persevered, never quit, and eventually broke through and beat the game. I remember even later, going broke in a $40-$80 game then running into a friend from Toronto named Zvi. I let him know "they got me" and he loaned me $500 to go back in there. Yes, I know it's beyond insane to play $40-$80 limit hold'em with a $500 bankroll, but those were different times. I turned that $500 into $2500, and a week later played my first ever WSOP bracelet event, the 1998 $2000 Pot Limit Hold'em tournament. It was also my first time playing pot limit, and I ended up... winning the whole dam thing! From $500 to a $169,000 payday in about a week. You'd think that would straighten me out for good, but no, I wasn't satisfied with being a $40-$80 grinder. After staking people, bad loans, and playing higher stakes, I blew all that money too. It was all part of the learning experience, and I promise you I wouldn't change one thing about it. So the Mirage. Bathrooms right next to the poker room- check. Parking wasn't too close, but when I ended up getting a car I'd always self park. So weird, because even today when I drop by the Mirage I still like to self park, force of habit I guess. The one thing the Mirage had/has that no other room had is show traffic! The poker room was smack dab right in the middle of the casino and there was always tons of tourists that would walk by the room. That made the games amazing. Guys would take their women to a show, and when the show let out, they'd HAVE to walk by the poker room. Often they'd have a few drinks, and play for a few hours. There were more tourist drop ins at Mirage than at any time in poker history. It's a shame the big games don't still go there, I'd love to go back to playing there again. Venetian For most of you, this will be the best poker room in town. It's HUGE and always seems to be pretty busy with a wide variety of lower limit games. They don't get high limit games, but if they did, they actually have one of the better private rooms in the city to play in. We did play $4000-$8000 there for a short time, and they have a very exclusive two table poker room pretty much away from everything. The room is perfectly designed. It's no Commerce Casino, but it's the closest facsimile Vegas has to offer. My assistant Patty and her partner Lisa play there all the time and they love it. The staff has always been very friendly and helpful and they offer a pretty regular schedule of low limit tournaments as well. I've done a few corporate events/appearances at Venetian and they are always very accommodating. It's not a room I expect to play in, as I don't play low/mid stakes anymore, but if you are a grinder looking to build your bankroll, Venetian gets my recommendation. Hope you enjoyed my brief look at some of what Vegas has to offer. The Orleans really should get a quick honorable mention as a place I used to cut my teeth playing $20 daily tournaments. 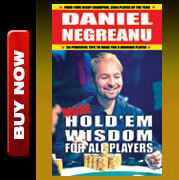 I don't even know if they run anymore, but the Orleans Open in the summer used to be my "WSOP" when I had no bankroll. The main event was a $500 buy in with daily tournaments ranging from $100-$300. In other news, I just came in 3rd place in the $100k Super High Roller event at Bellagio for about $450,000. 29 players started, and I wasn't even planning on playing until I heard there was already 15 registered. That's my second high roller event, and I've placed 2nd in January for $1,000,000 and then the 3rd here. Not too shabby, and the best news is since it got over 27 players I even get Bluff Player of the Year points! Ha. Tonight I'll be flying to Reno to take part in Jennifer Harman's annual charity event for the NSPCA. If you can make it, you should come out because it's always a fun tournament and it's for a good cause. Jenn loves animals as much as anyone, and I've been to the NSPCA to see first hand the work that they do, and I promise you it's a worthy cause. Then next week it's WSOP time!!!!! I am absolutely going to smash/mangle the tournaments this year. I'm more prepared this year poker wise, having played mixed games at Aria, and then the run in the high roller tournament. I'm expecting long days, every day for about 6 weeks which means I won't be doing P90X like I did last year. I'll try to get some exercise in when I can, but my focus is going to be on winning, and there is absolutely no way I won't be winning. There are three high profile events this year that will get my extra attention: the $25k NLH Heads Up, the $50k Players Championship, and of course, the $10k main event. Have I mentioned yet that I'm going to crush this WSOP? Willing to take 3-1 on a bracelet bet and also willing to make bets on player of the year points. Let's gamble!